Vacation rental softwarefrom ivacationonline.com is packed with so many features it makes running your vacation rental business a pleasure. 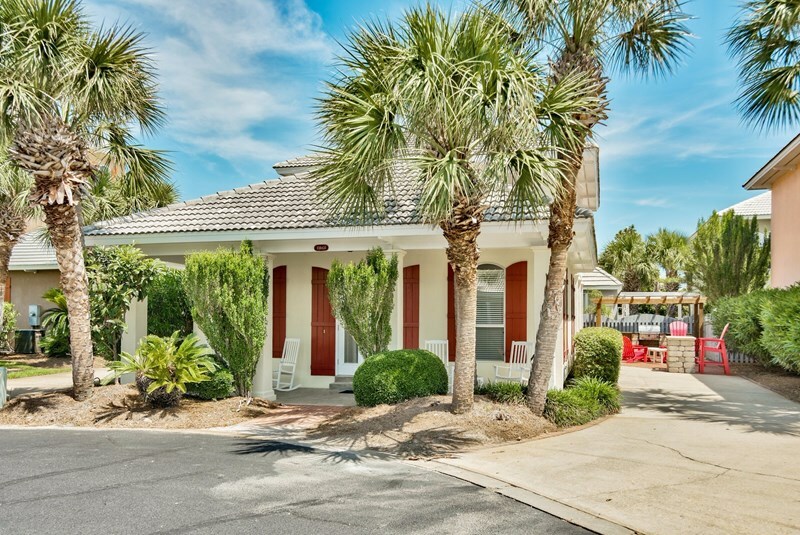 If you own one or more properties or you manage many properties, the patent pending online vacation rental reservation system by ivacationonline.com can handle every aspect of your business. From state of the art listings, online booking with credit card processing directly to your checking account, automated email system to private domain names and full management sites, you will not only be professionally running your business, you will look professional too. Here are a few of the highlights of the vacation rental management software. If you want to automate and increase your business, you are in the right place! Review these patent pending features and be sure to sign up for ourFREE TRIALtoday. 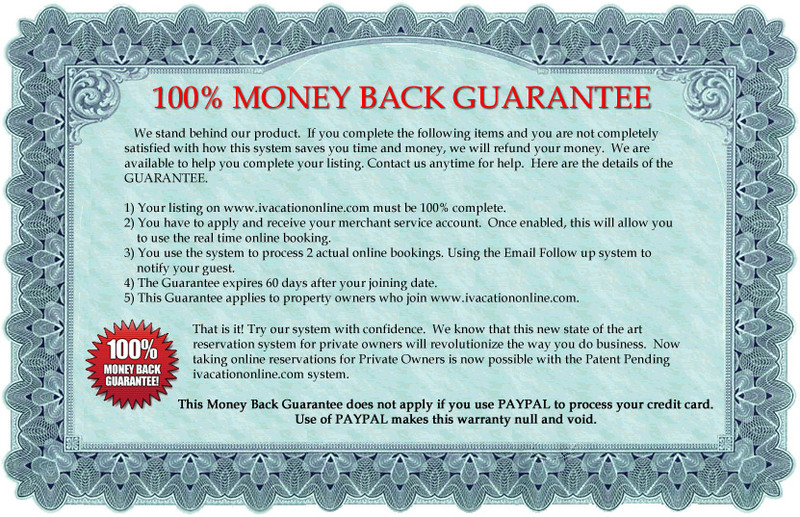 Click here to see how other owners are benefiting from the ivacationonline.com system. Need help with your Vacation Rental business? Are you advertising properly? Is your unit priced right to maximize your gross rents? What else are you doing right or wrong? 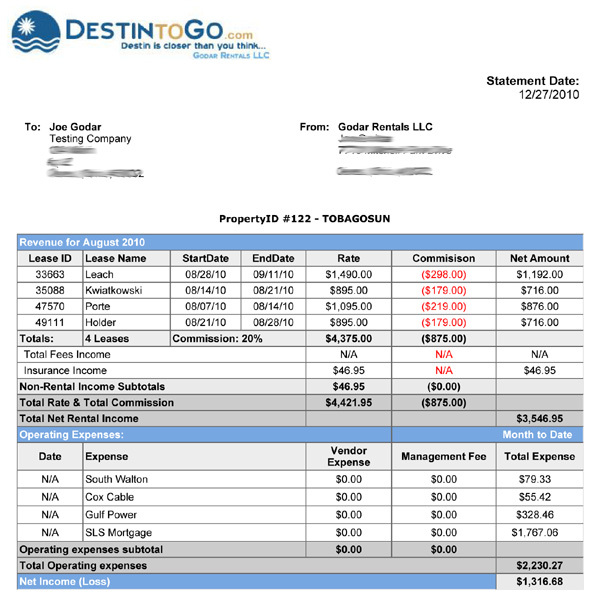 These are all things that go into running a very successful Vacation Rental business. We also consult with owners and hold seminars all over the country. Here is our other site:VACATION RENTALS FOR PROFIT.COM. We have the experts to help you.Click Hereto "ASK THE EXPERTS", they are happy to help at anytime! Have a first class video done for your vacation rental by Bretter Video. Video is the new state of the art marketing your guests are looking for. Not only will it showcase your property better than your competition, you can also see better SEO from a good video online. This video can be used on your ivacationonline.com listing, FACEBOOK, YOU TUBE and any where else. Run your vacation like a first class resort. Contact BRETTER Video today to schedule your video shoot. At ivacationonline.com, we offer rental unit owners a fully functioning reservation system available for those who manage their own units. If you have one vacation rental unit or ten, you can take advantage of our easy to use system. Simply specify rate schedules, policies, minimum-stay requirements, tax rates, etc. in your property profile, and this state of the art system automatically calculates rental rates, deposits, and taxes, as well as informing potential renters of your property policies. You then have the ability to accept the charges as calculated, or override them in favor of negotiated rates. Whether it's accepting a last minute reservation, changing your fees, or editing your terms and conditions, you'll be able to do all these and more with ivacationonline.com. After your guest has booked your unit, you are notified by email, and you decide whether to accept or void the lease. When you register your private domain name for your listing on ivacationonline.com you are then able to use the GOOGLE ANALYTICS program. We have a domain service to help you do this:www.ivoldomains.comOnce you have a listing on ivacationonline.com you can then go towww.ivoldomains.comand purchase a private URL of your choice. What does that mean? Here is an example of unit 122 on ivacationonline.com's URL;/Rentals/Rental_View.asp?PropertyID=122. Brand your listing with your own personal emails and logo. Do you want to stand out from the crowd! An exclusive feature on ivacationonline.com is the ability to have your logo on your listings! See an example here onunit 122.You can order your logo from us and we will create one that gives you a special look for the way you run your business. Add the "EMAIL FROM" feature and you will have your own personal booking system branded with your look and feel. The EMAIL FROM feature allows you to have your booking emails come from YOUR EMAIL and not the ivacationonline.com Notifications emails. Domain name. Tie all of this in with a domain name pointed at your listing and you can have a custom booking system branded with your business domain, logo and emails. ivacationonline.com has custom templates for your owners listing pages. Dress up your OWNERS PAGE with one of these Custom Templates. Your "OWNERS PAGE" is the page that contains only your listings. If you click on,"View all rentals by this owner" on your listing, you land on your OWNERS PAGE. This is the page that the template will replace. This will now give you a private customized site for your rental business. The cost is $99 for the custom template to be installed on your owners page. You can fill out the form below and pay online. The page will be installed for you. This will replace your "Owners Page". The template will not have any links or mention ofwww.ivacationonline.comas this allows the owner to promote their own business. The search feature will only search the owner�s properties. We recommend adding a private domain name to this listing for a custom application. The domain name must be purchased separately throughwww.ivoldomains.com. Read This about your own Domain name. Owners with more than 4-5 properties or management companies may have a need for a separate, stand alone web site. www.destin-dreamin.comThese are completely independent sites. They can be integrated with the ivacationonline.com patent pending online vacation rental software and online booking. So your guest can book online right on your new multi page site. Both of these options are available and both ways are linked directly to your listing on ivacationonline and the online booking is integrated into your site. No need to update a calendar on either site! Please contact us for pricing on building individual pages for each property. Just pick a site template, fill out the form and pay online. Someone will be in touch with you to start building your site! Have you ever had the question asked to you by a prospect, "How do I know this property is real and you are the owner/manager?" Now you have a way to deal with that question. ivacationonline.com takes online security very serious. We hope you do too. We have a VERIFIED PROPERTY program to help ease the stress a potential guest may have when shopping for a vacation rental. When you submit and qualify for our VERIFIED PROGRAM, we will add these icons to your listing page and Guest Information page. This is a way of telling your prospects, you have been verified by a 3rd party and it is safe to book with you. The information in the box below is the information that will show on the Property Verification page that the potential guest will see when they click the Verified Property image from your listing. There are so many good reasons to accept credit cards! It will expedite the rental process! It will define you as a legitimate business! It will help secure damage control! Your quests will earn reward points that will help then get to their vacation destination! In addition to the good reasons above, accepting credit cards will give you Protection and Peace of Mind! As a VR home owner you are more protected when you take a credit card for payment because in the event that a guest damages your VR home, you will have a credit card to charge to pay for the damages. Of course your rental contract needs to read as such with a statement that says that you reserve the right to charge the guests card if damage is done beyond the amount of the security deposit. It will give you peace of mind! It will put an extra factor of "accountability" in the mind of your guest! With the guests' signature on the rental contract, your chances of winning a dispute (otherwise known as a chargeback) will increase significantly. www.eComMerchantSolutions.comspecializes in working with VR Owners and will set you up with the ability to accept credit cards and electronic checks affordably � even in the slow season! Already accepting credit cards?... You may be paying too much!! Let one of the friendly sales representatives at eReservation Solutions take a look at one of your current processing statements and in minutes, tell you what they can save you! To date more than half of the over 300 VR Owners they work with were already accepting credit cards and after contacting eReservation Solutions, they opened a new merchant account with eReservation Solutions and not only enjoy the service they provide but the savings! If you are in a contract with your current provider, don�t let that stop you. eReservation Solutions will pay your closure fee in full! If you are managing properties, the ivacationonline.com system has reporting to support your business. 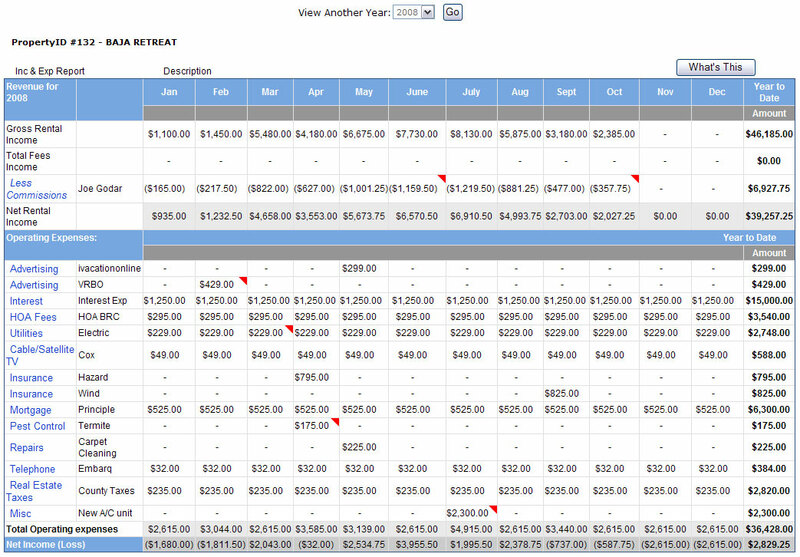 There is an EXPENSE spreadsheet you can populate with your expenses and the system populates your income. Then you can generate a pdf of the Owners Monthly Statement. This can be emailed to multiple parties. 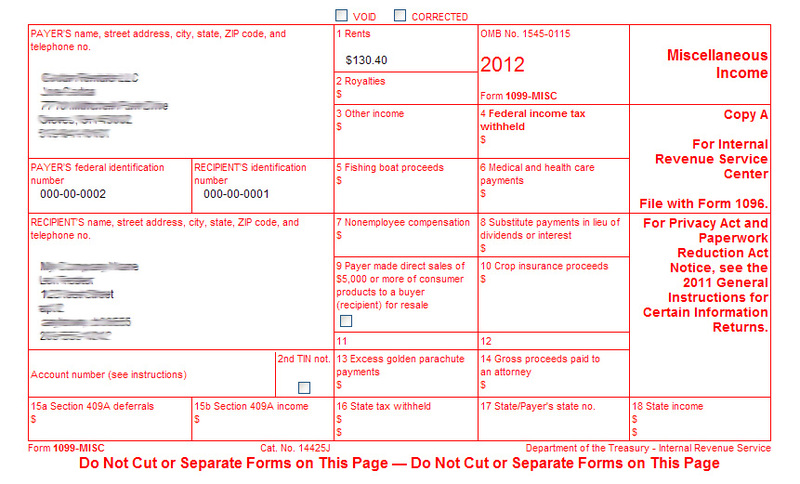 You can also generate a 1099 for year end income reporting. Here is an example of a pdfs that the system can generate. Use your company email so the guest is receiving emails from your account. Choose to charge or not charge commission on fees, rent or Insurances. You can control what is paid to the owner and what is charged commission. With this Owners Statement it is easy to keep track of your monthly payments to your owners. Staying in contact with your guests is the number one way to assure that they will return to your unit. Reliable repeat business is one of the goals of every owner. It helps cut down on advertising. As you build your repeat business that becomes one less reason to spend money on marketing. The ivacationonline.com Marketing System makes this a seamless process. Every person that books with you is "Saved" in your Marketing System. There is no need for extra data entry. You then have a series of emails at your finger tips, that you can send at anytime. Staying in touch for the holidays or reminding them to book again with you has never been easier. You may even add emails from your guest that are not in the ivacationonline.com system. Staying in front of your guest is now an easy solution with the ivacationonline.com Marketing System. 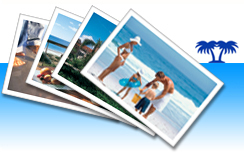 If you refer an owner to ivacationonline.com you will receive up to 3 FREE months added to your subscription. When an owner joins, there is a field in the sign up area to enter the REFERRING Owners name. They must enter your name there. Once the new owner joins and pays, the 3 FREE Months will be added to your account. You will receive 3 months if they pay in full for the year or 1 month if they join using the monthly payment plan. Tell your friends! Tell everyone! You can have as many referral owners as you like. We love referrals! Ready to try the FREE TRIAL? This is a section to manage your contacts. Many owners need the contact information for their local help. You can enter the contact information for your local manager, cleaning crew, heating and air repair company, utility company, or any other contact that you may need for the running of your rental business. We suggest to enter as many contacts as you can think of. It is always better to be prepared so you have the name and number of someone before you actually need to call them. The ivacationonline.com system provides you with a private SURVEY. This can be emailed to your guest AFTER they stay with you. They fill out the survey and it becomes part of your guest file. No one else will see it but you! 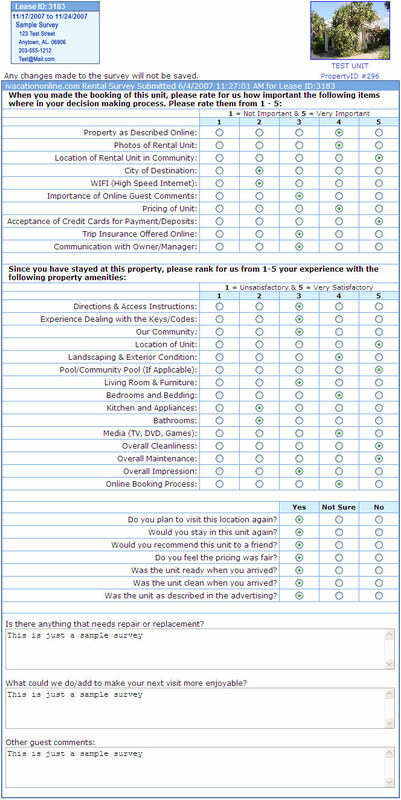 Then you can see what your guest honestly thinks. When you get a call off of a different site, send them to your Online Booking listing on ivacationonline.com. Each listing has a unique listing number. After seeing the site that you have customized, they have the ability to book then and there! The guest will love to hear you talk about your unit. This gives you the chance to really "sell" your unit. Be sure to explain to them how the online booking system works. You have up to 10 minutes of recording time. This feature will allow you to show your online booking calendar on other web sites. This will allow you to have the same online booking on your private web site or other web portals that support this iframe code. To put this code on another web site, just copy and paste this code into the site where you want the calendar to display. This will be 100% integrated with your online booking on ivacationonline.com. The guest will actually be booking on ivacationonline.com thru your web site. This will stop you from having to update any calendars. By incorporating a PICASA web album, the patent pending ivacaitononline.com listing is state of the art. Now you can have the code from your PICASA web album embedded into your description so you have a professional slide show playing all the time. No clicks by your guest to see anything. It plays when they land on your listing page. Your guest will have to approve of your contractual Terms and Conditions before they book your unit. And this can be done quickly! Before ivacationonline.com, most rental unit owners got the leases to their guests via snail mail or email. Not anymore! Now it is done online, and YOU set the terms! By the guests clicking that they have read and agreed to your terms, they are providing you with a legal, electronic signature. This allows you to operate like the real business that is yours! The ivacationonline.com system will track your guest payments whether the source is a credit card from your merchant account, PayPal, or by check mailed to you. You have ability to easily keep track of details that allow you to know who owes, and when payment is due. 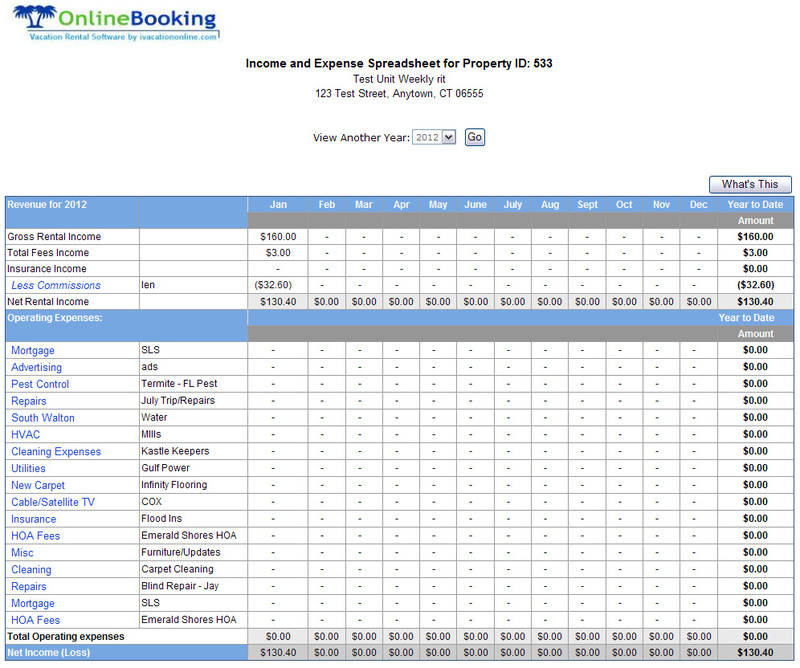 With the ivacationonline.com owners administration section you also get a fully functional spreadsheet. This spreadsheet will track your rentals on a yearly basis. So if you need help reporting your sales tax, tracking your income for your tax purposes, this spreadsheet will give it to you. This is a running total of your business for the calendar year. If you void a lease, the information for that rental is removed. It's easy to stay in touch with your guests with the ivacationonline.com. With an extremely professional touch, your guests will receive emails upon their booking of your unit�complete with a photo of the unit! The system will then prompt you to "Accept" or "Void" the lease. Your guests will get an update too! When the rent is due, they get a personal, customized email, all contained within your administration section. Confirmations and entry instructions are also built into the system. This is where you add the cell phone number that you would like to send a text message notification to when your property receives a booking. It is a great feature for when you are away from your computer and do not own a Blackberry, Palm Pilot, etc. but would like to keep on top of your bookings. This section will allow you to create COUPON CODES that you can allow your GUEST to use when booking your unit. You can give these out in any way you see fit. Some owners may want to promote them on your sites while others may be given to select individuals for special savings. You create the codes here. You can edit them or delete them at anytime. The coupon field will not appear on your Guest Information page UNLESS you have created a coupon in this section. This is then added to the total and charged to the guest during the check out process. You can set up an OPTIONAL FEE to be either a nightly fee or a per stay fee. These will appear on your GUEST INFORMATION page once you have at least one OPTIONAL FEE set up. You can have up to 3 OPTIONAL FEES. With the ivacationonline.com owners administration section, we provide you a "Book Online Now" button for your other web sites. Simply copy the entire code directly under the button you would like to use and paste it in the html on your site. 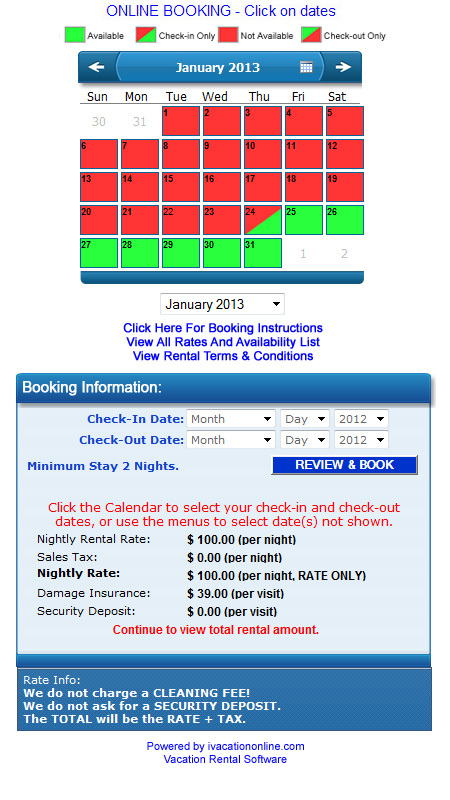 This will allow your guest to book your unit directly from your other web sites. We provide several different buttons for your selection. This will help "drive" traffic to your booking listing on ivacationonline.com!